I have been having issues with getting the photos to upload from the tablet so things are running a couple of days behind. Pete and I wend out for a ride with Petes mate Dave. 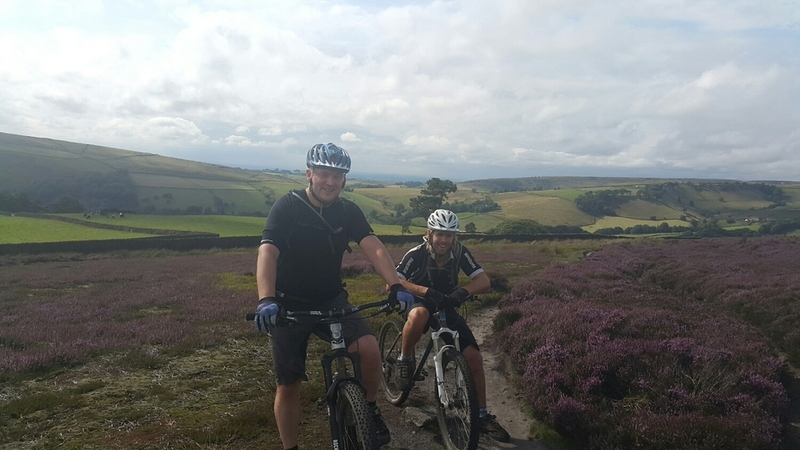 Dave has been living in Glossop for the last 3 years and has a wider knowledge of the trails. Dave has up up on another area of the moors so getting a better understanding of the area. Dave rides a 29er plus Crampas and a Transition 29er. Had the transition out for this ride, and Pete was out on his hardtail with front suspension. Dave and Pete with the purple flowers out on the Heather. The heather only flowers for a couple of weeks a year. Getting used to seeing these signs about. If you are going exploring you still need to take a map, as it would be easy to get your self lost. Pete getting into direction mode lol. The Peaks is a large water catchment area. This is a local dam. Amazing stone house in the back ground . Heading back home. Massive stone blocks coming away from the cliff. Whats this, a Pub! Might need to stop in for a taste! We, so far have kept up with a ride every day. Heading of to stay with Alices Mum in Matlock tonight and her Dad on Saturday night. Be and Christina are coming up from London for the weekend so it will be mint to see them again.